How we calculate the Zipper Length. The rules of zipper measurement is very simple but some time it becomes a matter of big trouble for us. Actually it depends on the fabric & zipper properties. So, at first we must need an idea about the shrinkage of body fabric & zipper tape. Some zipper measurements are not very complicated such as pocket, leg opening etc. 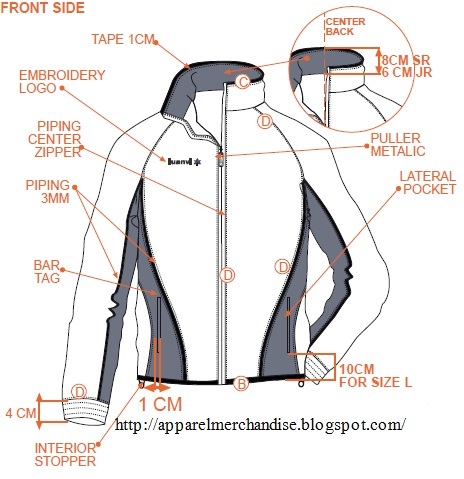 Here, we only discuss about the front long zipper of sweat shirt or Jacket or as like that. Moreover, the rules is not always remain fixed, its may vary depends on practical situations. However, I always advise that you must confirm the zipper measurement with your cutting master & production manager before place an order. Nice presentation !!! thanks to help to learn something !!! Really Excellent & Helpful for a technical people !! !